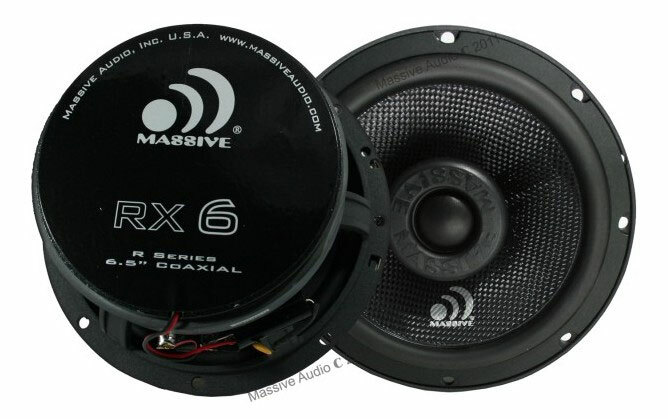 The "RX6" coaxial mid range speakers handle 50-200RMS each and are designed with cast aluminum baskets, glass fiber cones, soft rubber surrounds, powerful 35 oz magnets, 25mm soft silk dome tweeters and custom two piece paintable grills. As all ways all Massive Audio 2011 speakers are 2031 CEA compliant. These co-ax speakers will provide outstanding bass tones normally found on subwoofers and allow up to 400 watts peak power that are perfect for users that require lots of smooth bass along with sharp mid range tones in their mid range speakers!